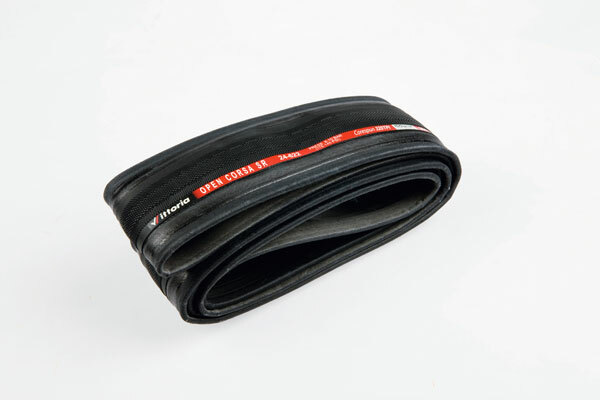 When you look across the range of Vittoria tyres the top end is heavy with alternatives. Given the firm’s stated aim of “producing the best and fastest tyres in the world” that’s not a surprise, but it does make getting the correct model a tad difficult. And that difficulty just got worse with two more additions: the Open Corsa SR clincher, and the Corsa SR tubular tyres. The SR in the name stands for Special Race, and basically it’s the tyre that’s been developed for the pros with the tubular version undergoing final testing during the Giro and Tour last summer. The details of the actual changes are close to vague: “In wet or dry, rough or smooth, on the climb or descent, it stretches the outer limits of what’s possible” – well, quite! Using Vittoria’s 320 TPI cotton carcass that we’ve seen in previous Corsa tyres, it has exceptionally supple sidewalls – the rubber used is an update of the ISO Grip compound and is about getting the best grip along with reduced rolling resistance and presumably a sacrifice in durability, all in a 24mm width. The tread also gets a tweak, with the herringbone pattern of old gaining a curved diamond pattern. Expect to pay £66.99 for the tubular and £47.99 for the clincher. This article was first published in the January 17 issue of Cycling Weekly. You can also read our magazines on Zinio and download from the Apple store.